One pot and you're done-delicious recipes using everyday kitchen equipment With every day so busy, wouldn't you just love to throw everything in one pot and have dinner ready? With Weight Watchersʼ One Pot Cookbook, you'll find 300 super-tasty and healthy one-dish recipes that the whole family will love. These no-fuss recipes are more than just easy-they are healthy and nutritious, as they come from the culinary experts at Weight Watchers. You'll find over 300 delicious and comforting one-pot recipes that include casseroles, pastas, soups and stews, light stir-fries, and desserts-all accompanied by 100 beautiful, 4-color photographs. Organized by type of cooking vessel-everything from casserole dishes, skillets, woks, saucepans, slow cookers, pressure cookers, even specialty equipment such as fondue pots-this book lets you make the most of your kitchen tools while cooking delicious meals for the whole family. Also included in this ultimate cookbook: All recipes include nutrition information and Weight Watchers PointsPlus values. Extra Healthy Tips provide easy suggestions for additions to the recipes. Tons of introductory information on each type of pot-from skillets to slow cookers-is also included. 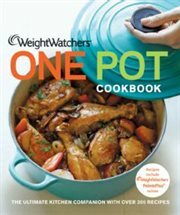 For great-tasting, nutritious meals that are easy to prepare and quick to clean up, turn to Weight Watchers One Pot Cookbook. Publisher: [United States] : Houghton Mifflin Harcourt, 2013.